How are y'all with humidity? Me - not so good. I'd sooner it be in water than sweat. temporary curls if you used them with damp hair! or velour (not stretch) or flannel. 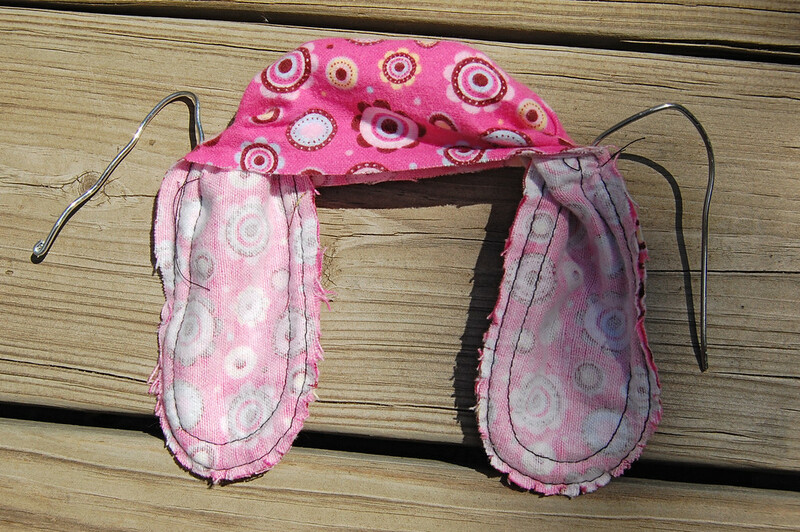 These just hold the hair better during use. 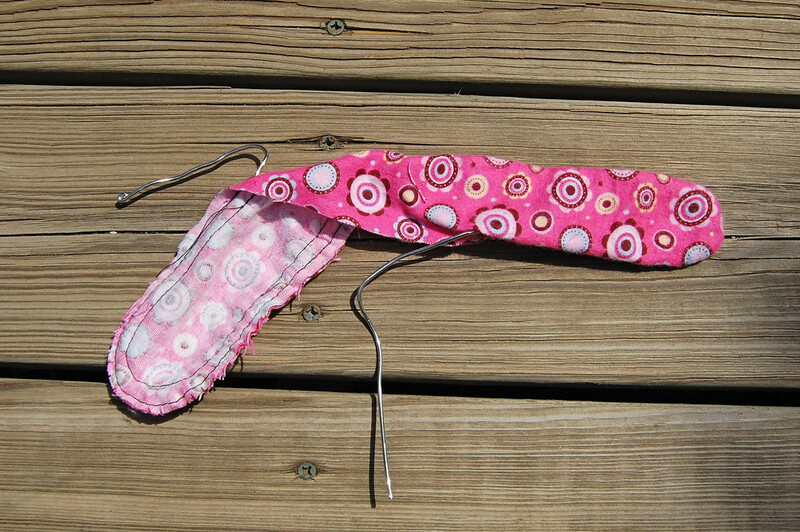 Two pieces of fabric 16.5" x 3" each, cut with rounded ends as shown. 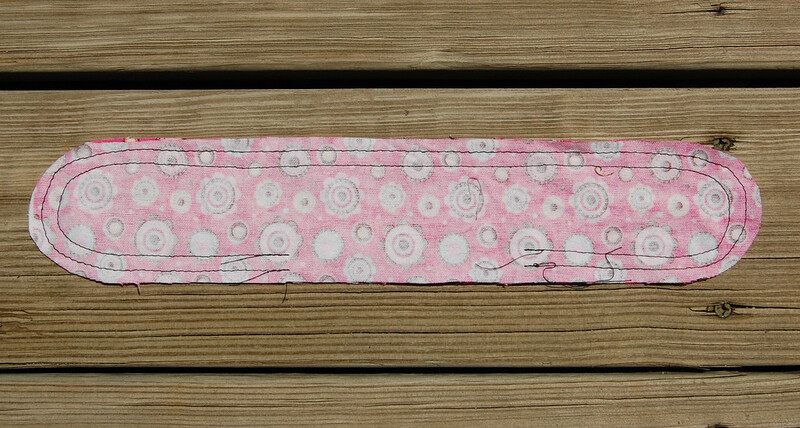 One small piece of scrap fabric, about 2" x 1.5"
Two pieces of fabric 11.5" x 2.5" each, cut with rounded ends as shown. 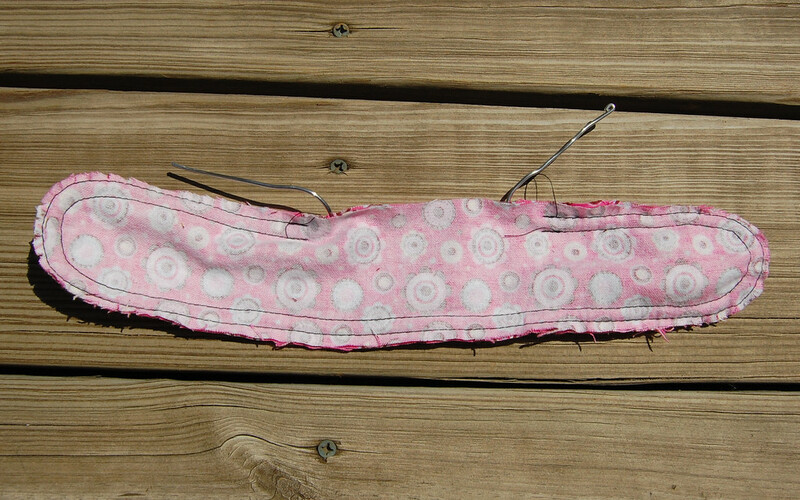 Place the two large pieces of fabric right sides together and sew two lines of stitches around the perimeter. 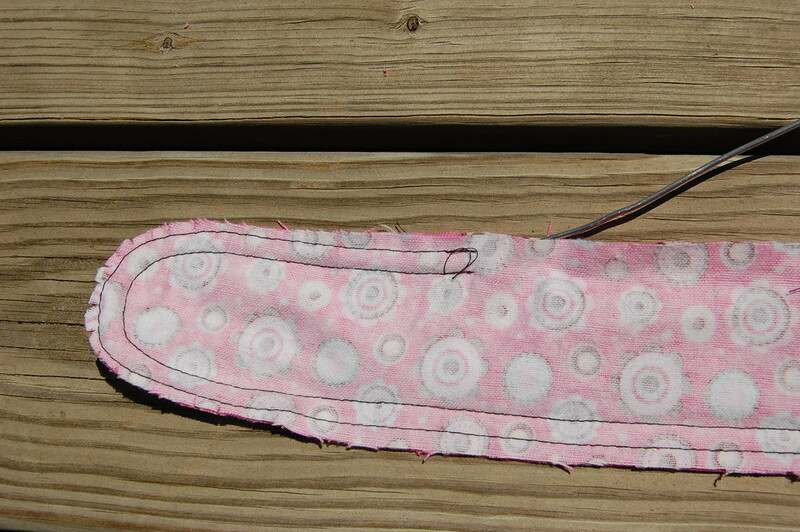 Use 1/4" seam allowance for each, so that the total seam allowance is 1/2". 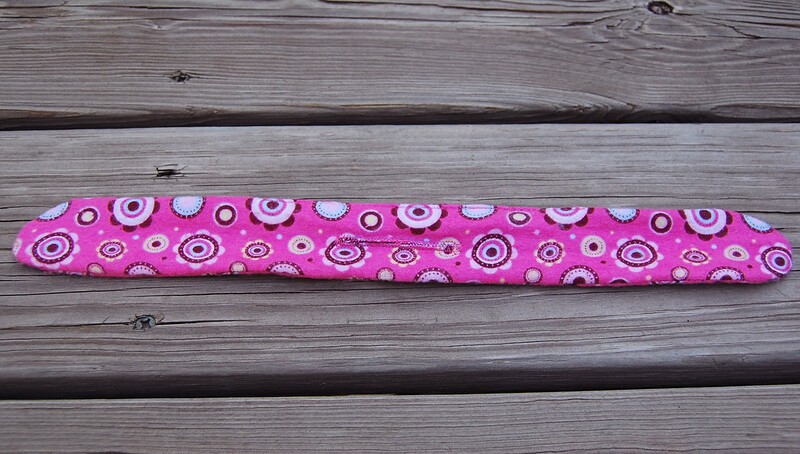 Leave a 4"-5" opening along one straight edge, backstitching where you began and ended. 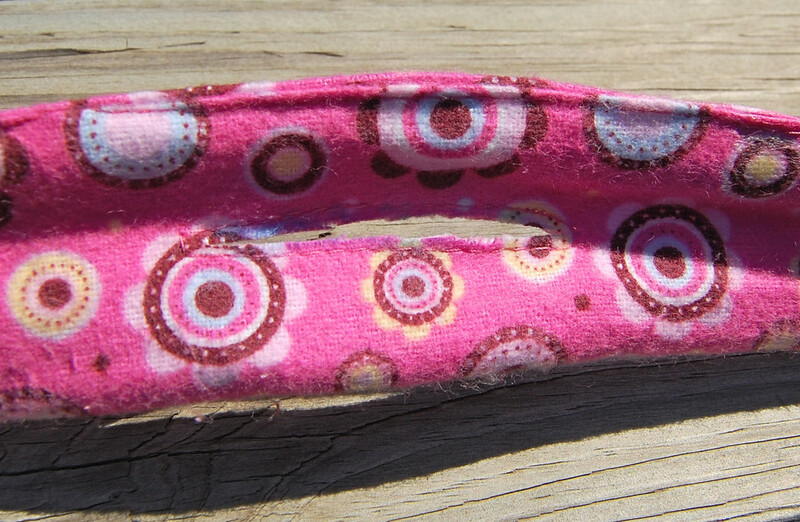 You have just made a narrow casing along the edge of the fabric for the wire. 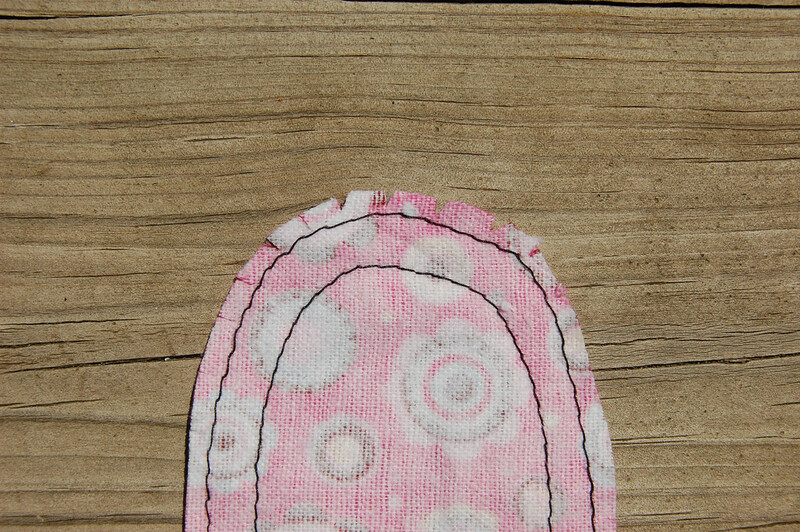 Notch/snip around the outer seam allowance of the rounded edges. 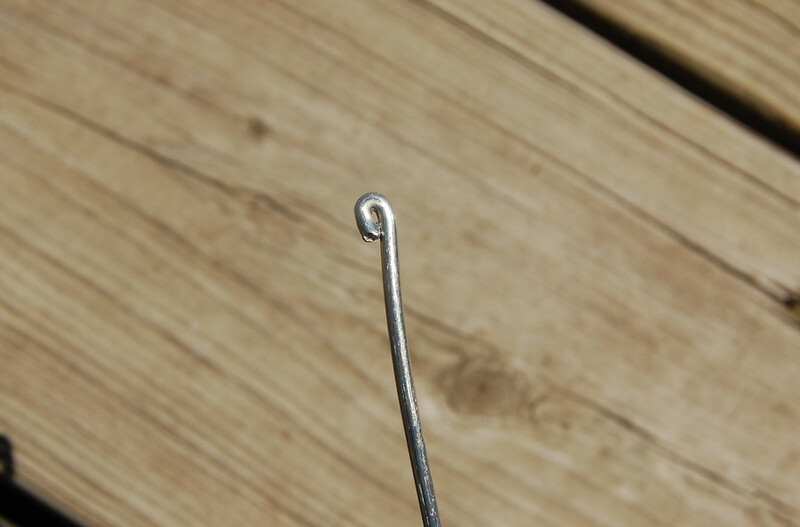 Using the pliers, make a small rounded loop at one end of the wire to facilitate smooth movement through the casing. 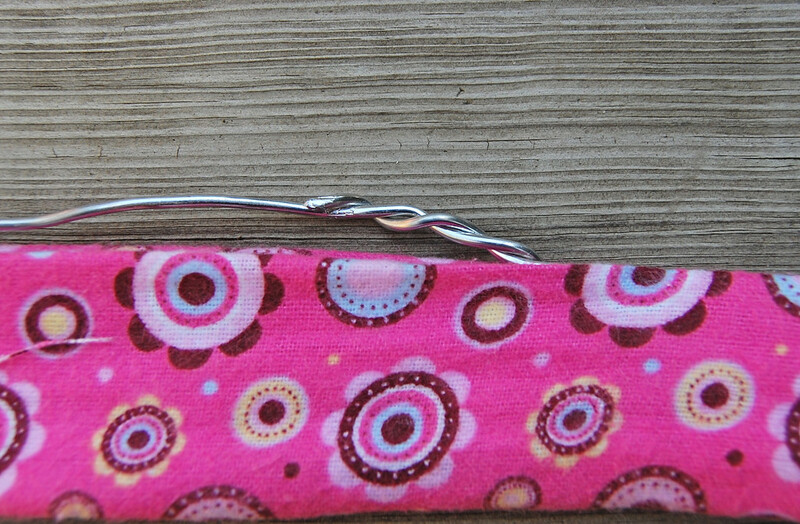 Insert this rounded end of the wire through the opening and between the two stitching lines. till it emerges at the other end of the opening. Turn right side out. This step might take a little while (like 2-3 minutes, not hours) so be patient. It helps to gather the fabric around the wire as you go i.e. it's OK if a lot of the wire re-emerges from the opening as you work. If you're thinking: why not turn the thing right side out and then insert the wire? I am sad to report that I tried that first, with three different thicknesses of fabric and it did not work. Too much bunching at the ends for the wire to move through. If anyone manages to do this, tell me, please, OK? Here is one end done. When you get both ends done, push as much of the wire back into the opening as possible to stretch the fabric taut over the wire frame. Then cut off the little rounded loop at the end of the wire with the wire cutter/pliers. Twist both ends of the wire together, overlapping about 1.5"- 2". Cut off the excess with the wire cutter/pliers. 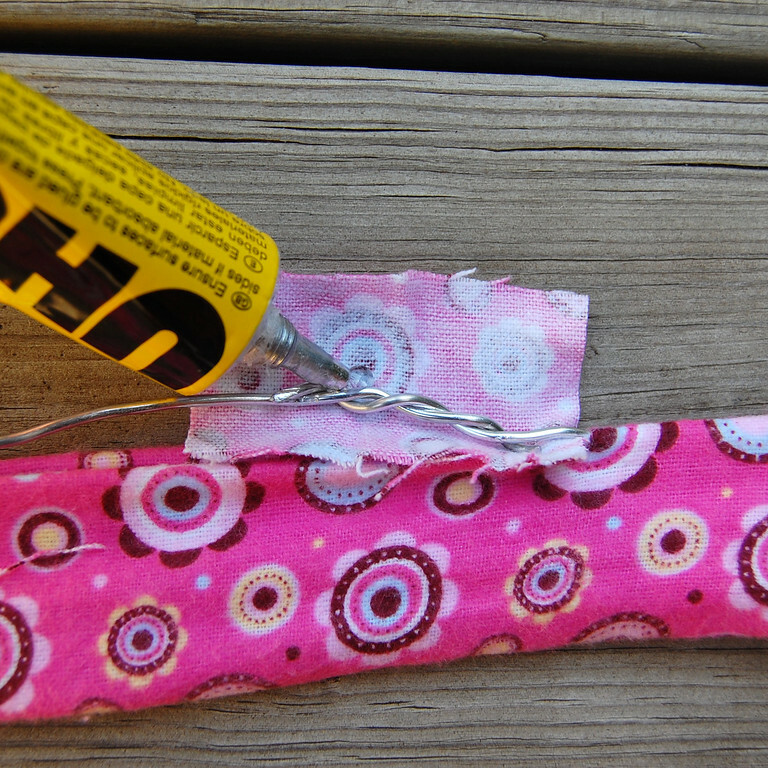 Wrap the small piece of scrap fabric around the twisted wire to cushion it, using craft glue to secure. Tuck the wrapped wire back into the opening. 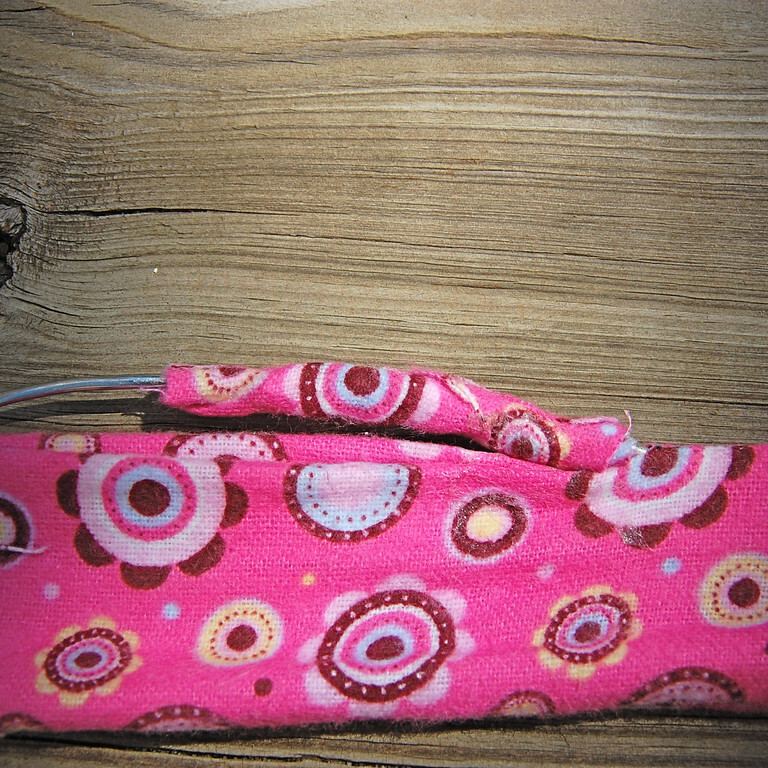 Fold in the seam allowance of the opening and top-stitch it shut- you can see this in the next picture in Step 8. You are now going to make a giant buttonhole in the center of the bun maker. If your machine has a superlong buttonhole foot, go for it. 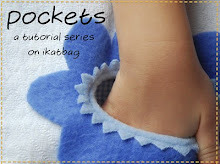 Otherwise, you can use the old-fashioned method of making buttonholes with just the zig-sag stitch. 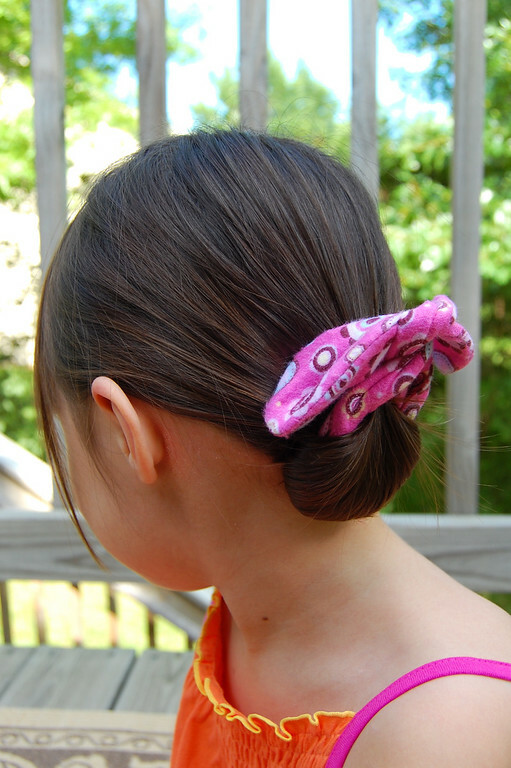 Measure and mark a line 2.5" long (or 1.75" long for the child's version) in the center of your bun maker. Sew around the opening about 1/16" away from the line all round. Cut along the line and between the rows of stitches flanking it. 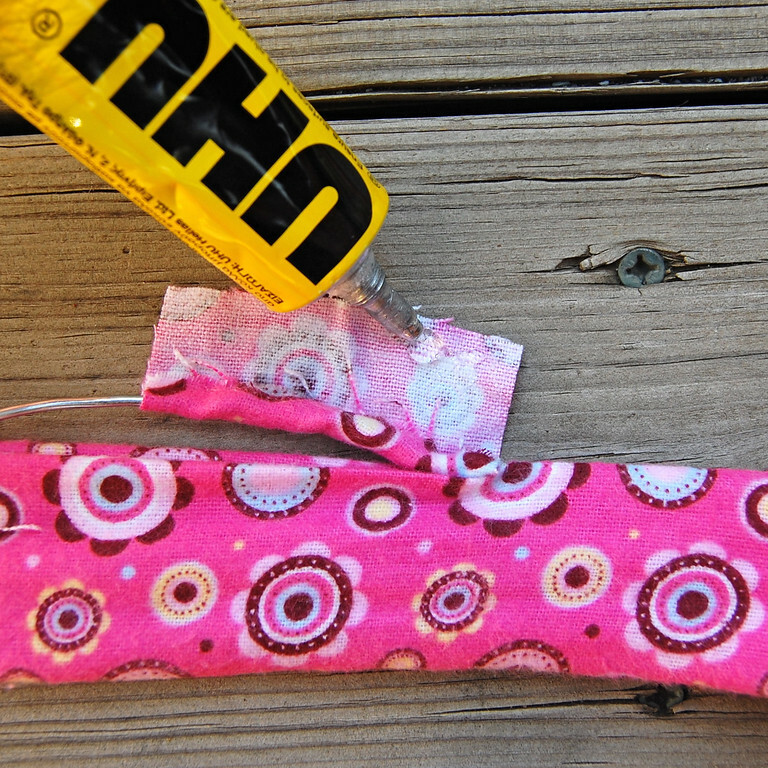 Use a very close zig-zag stitch to seal in the fraying edges, reinforcing at the ends of the opening. You can also zig-zag before cutting, the way we usually do buttonholes. I did it this way almost like an overlocking stitch because of the amount of wear and tear this opening will undergo when the bun maker is in use. although you are still wondering how in the world to use it. she mistakenly believes princesses do. 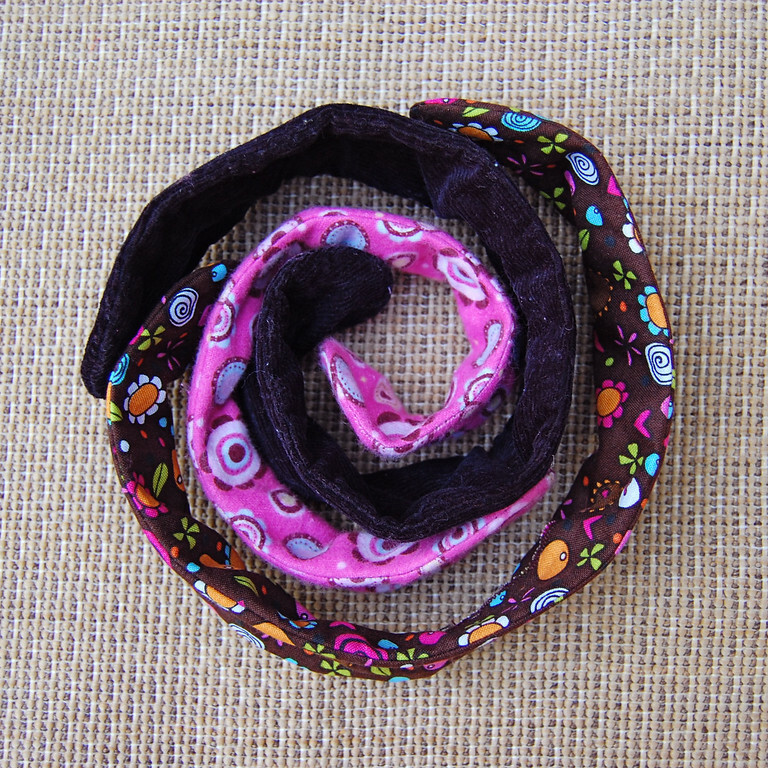 real hair bands but will do in a pinch. another way to beat the summer heat. brilliant! I got one of these as a gift in high school, but I haven't seen them in stores since. ah yes. i remember this now. I had clearly forgotten about it until this post! Cool. I must go and try making one. Will let you know how it turns out when I do. Just so happens that I have the materials available! You have a great blog!!! So mnay neat ideas! Love this one! TFS!! GREAT JOB! This is just a wonderful idea. Darn! And to think I just cut my hair all off about two weeks ago. Darn. Oh, i love this. And would be a nice change from my usual "french twist" held up with... those clips with all the teeth... forget what they're called. I found you through Craft Gossip and was SO happy to see the link to the font generator!! I had tried this a while back and it wouldn't work, but was just thinking of it the other day! :) COOLIE! I bet my teenage girl would love this! Thanks for the great tutorial. I can't wait to make some! Brilliant! Thanks for the instructions! This is a wonderful tutorial. 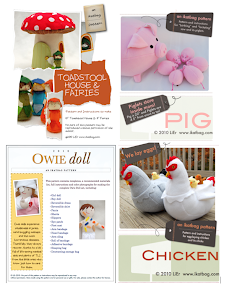 We've posted it at our http://SewingBusiness.com blog. Great idea for these hot summer days! 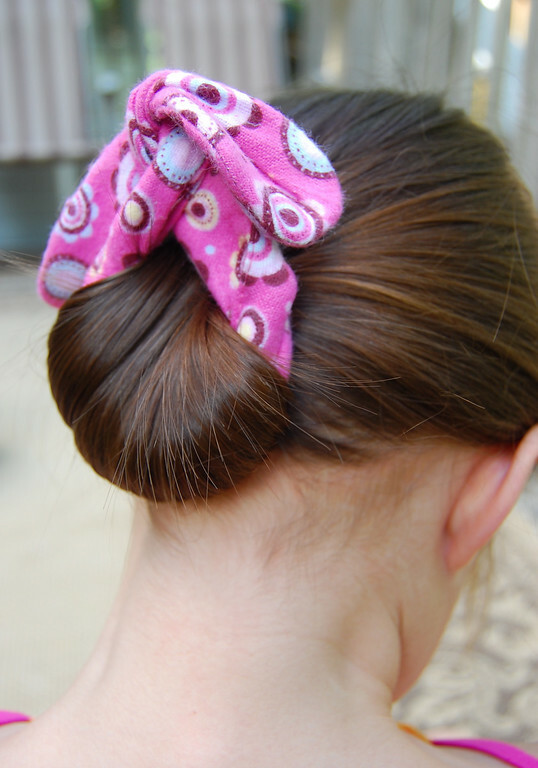 The link to how to use the bun maker is no longer current--do you have another link? Thank you so much for this great tutorial. I had never seen a hair accessory like this one but made one the day I saw your posting. It works great and provides a look that I definitely like. I used 20 gauge wire that I found in our garage. I think it may be a bit too bendable. Do you recall what gauge wire you use for yours? I may try another one with a stiffer wire. Thanks too for the YouTube link on how to use the item...most helpful. I have the supplies and about to make one. 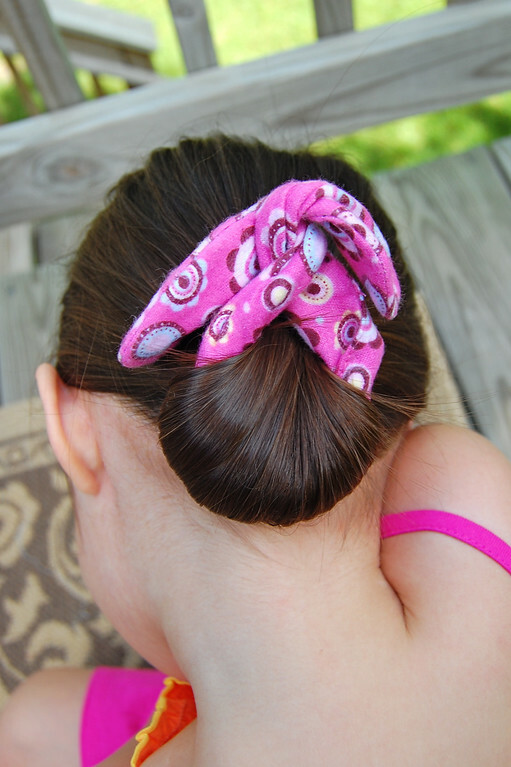 I am hoping this is the answer for my daughter's VERY THICK and LONG hair! For those who were asking about wire gauge - if you enlarge the picture you can see she used 12 gauge floral wire. I did some research looking for a wire that would take a lot of bending without breaking and Armature was recommended (though it appears to be aluminum just like the other wires). I know nothing about it, so not sure if it will work for a bun maker. I was going to try it, but the local Michael's did not have it, so I got floral wire (cheap, so no loss if it does not hold up). I think I will check at the hardware store and look at electrical wiring - it may work (and may be cheaper too). I've bought several of these at craft faires. And I love 'em. I want to make some because I haven't seen them lately and I want them to go with more outfits. I have very fine hair and it keeps it out of the way and away from my face. They are very stylish. Thanks for all the pictures. Perfect!!!! Thank You again. I finally found you by typing bun maker!! We bought one called EZbun dot com and then I found another brand called Qwikbuns that are both still in business and have video tutorials for how to use them. 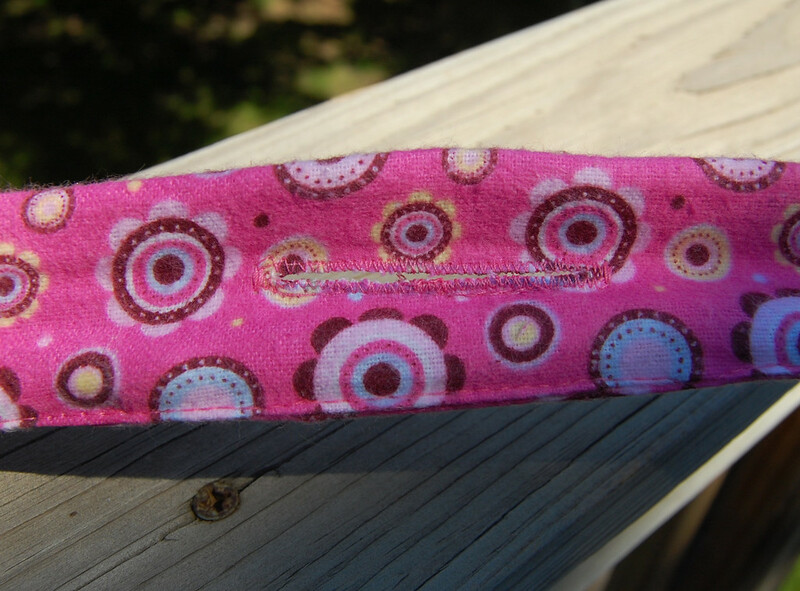 I LOVE that thanks to you I can make my own rather than paying $8-10 plus shipping for the online ones! Thank you. 2 brands that have video tutorials are ezbun and qwikbuns. I'm so glad you shared these instructions so I don't have to pay $8-10 plus shipping for the online ones. 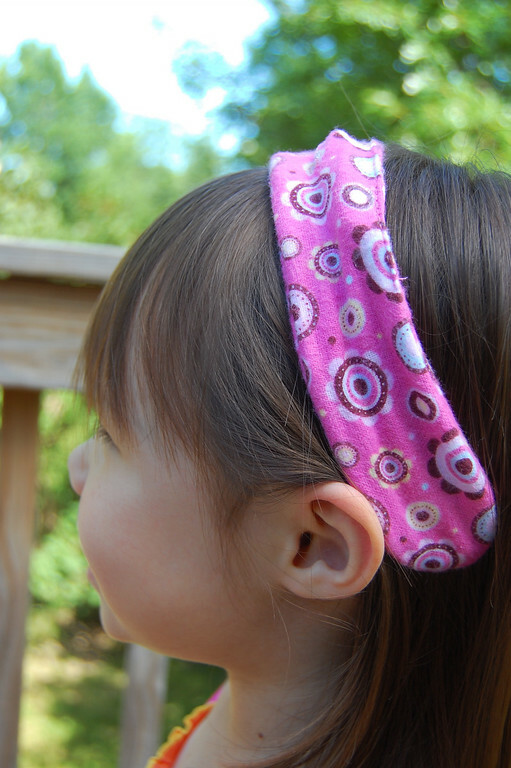 We have an ezbun and I now I can make several more to match outfits! Thank you. Hey this is super good for my hair and i got poisened ivy on face and neck. This helps a lot and take my mind of the ichy ness while making it. I have been looking for something like this! Great! Thank you thank you thank you! 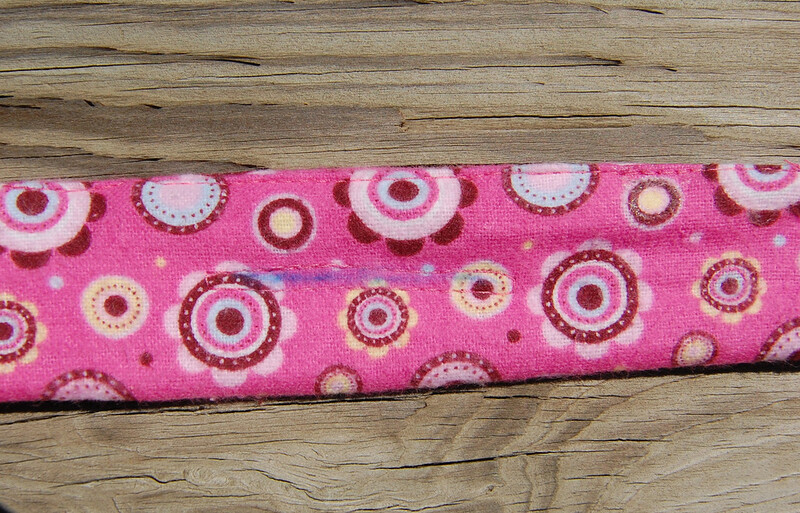 I just made one for my girls to wear to gymnastics class. Yay! I really appreciate your sharing this tutorial. And boy was feeding the wire through hard on my hands (I have a very thick wire). Thanks for what you wrote about turning it inside out -- my first reaction was to turn it rightside out and then feed the wire through, so I appreciate your wisdom! I'm looking for the right wire to make some of these for my wife, what gauge of wire are you using?